The 2019 Chevrolet Silverado pickup trucks will be larger and faster than before, yet more fuel-efficient by losing up to 450 pounds, not by going all-aluminum and all-turbo like Ford but with a different approach. 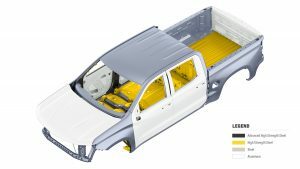 Leading up to the reveal of the all-new 2019 Chevrolet Silverado pickups, the big questions have been about aluminum. Would they go all-aluminum like Ford and make themselves hypocrites after beating up their beds with toolboxes and bricks for the past couple years. The short answer is no. Weight had to be lost though and what Chevrolet has done is use the same mixed material approach they’ve been applying to cars like the Cadillac CT6 and their crossover SUV’s to shed as much as 450 pounds from the largest 2019 Silverado crew-cab V8. It’s not the some 700 pounds of weight savings Ford boasts of but Chevrolet chose to stick with steel for large expanses of the body structure including most importantly the bed, the one place of the truck that must endure and take punishment more than any other. An all-new bed design is now constructed of a mixture of materials starting with a roll-formed high-strength steel floor panel that’s stronger and more robust than in the 2018 model. The side structures are made of milder steel and because of they don’t share the same stamping as the floor are designed to allow more flat space in the bed. This results in a design that allows more space around wheel wells, about 20% more cargo than in competitors with a one piece stamping. Chevrolet tells us that new storage bin options will be available that can fit snug in the new areas and still allow for a stacks of 4×8 sheets between. 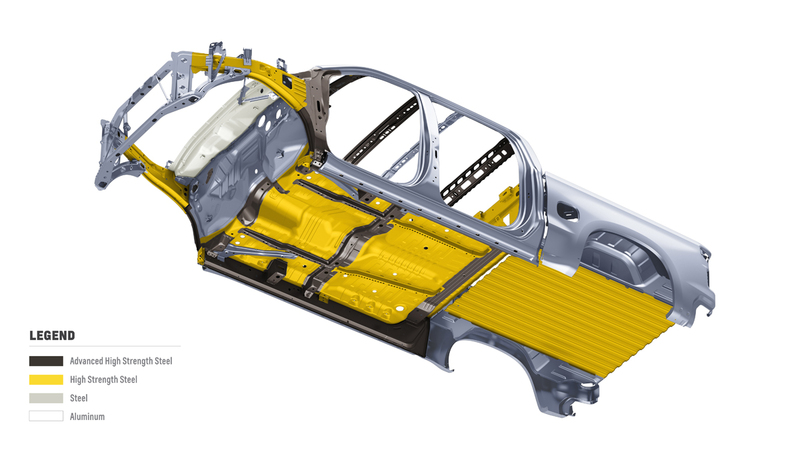 Most notable of this new bed design is that Chevrolet could later change the material used in the side sections to composite or aluminum if desired to save weight. The tailgate here however is aluminum as are all of the opening panels of the new Silverado including the hood and the cab doors. 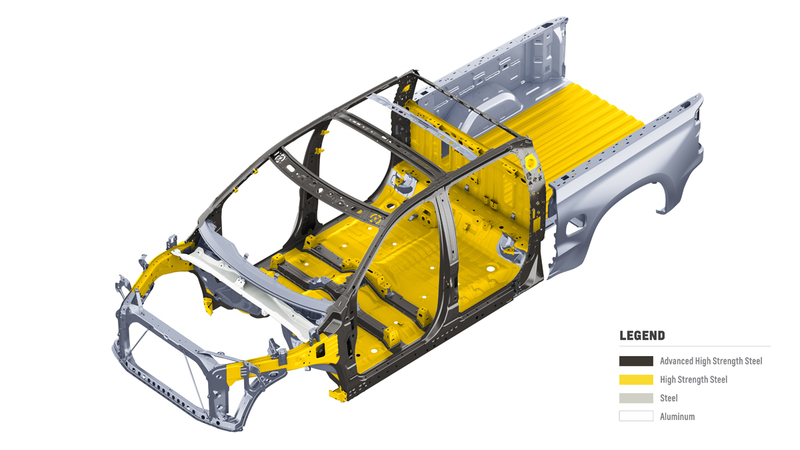 The cab itself uses a combination of different metals starting advanced high-strength steel for the safety cage. This main superstructure of the strongest metals create the rigidity and strength for crash performance and that solid feel you want. This is then backed up with high strength steel in the floorboard and rear wall for shear strength along with the forward bracing for the front body structure. Outer skin such as the front fenders, the A, B, and C pillars as well as the roof are mild steel as are the firewall and radiator support structure. Aluminum is used in the cowl. Moving on to its fully boxed steel frame, the 2019 Silverado loses up to 88 pounds here yet sees a 10% improvement in torsional rigidity. This is because it’s made of some 80% high-strength steel in different sections made up from roll forming, hydro-forming, stampings and specialty formed blanking. Each section of the frame has different thicknesses from two to five millimeters depending on what’s needed and the rails themselves are joined by a combination of both high-strength and mild steel cross-members. Notable are the robust out-rigging structures seen at the front of the frame and behind the front suspension made of high-strength steel. 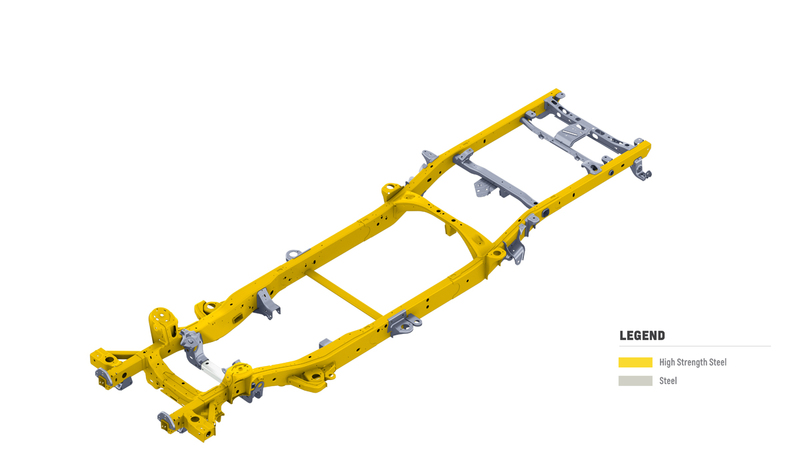 These additional structural enhancements should help the new 2019 Chevrolet Silverado perform much better than the current generation in the IIHS small offset crash testing. These significant strides in weight savings along with a variety of new powertrain technologies for 2019 should allow Chevrolet to be competitive with Ford’s all-aluminum body construction and vast array of turbocharged powertrains. Though it’s not as extreme as Ford’s move to the progressive it should allow for Chevrolet to hold their high ground on the tough gritty like a rock reputation they’ve been steel hammering Ford’s aluminum with for some time.